Paying your bills on time and keeping your credit card balances low can help you find cheap car insurance. 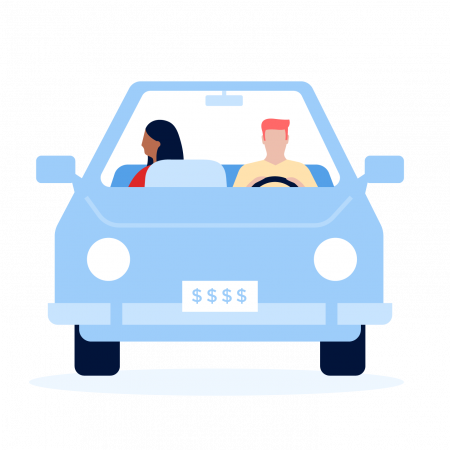 Along with other factors, such as your age and driving record, most insurers consider your credit history when they set car and home insurance premiums. Only three states — California, Hawaii and Massachusetts — don’t allow the practice for car insurance. Elsewhere in the country, a good credit history means lower car insurance rates, while poor credit means higher rates. If you’ve ever applied for a loan, you’re probably familiar with credit scores, which lenders use to approve credit card or loan applications and to set interest rates. You also have a credit-based insurance score. Companies such as FICO, LexisNexis and TransUnion calculate these scores for insurance companies based on your credit history. Unlike a credit score, which lenders use to predict whether you’ll make loan and credit card payments on time, insurers use insurance scores to predict whether you’ll file claims. Research shows that people with low insurance scores tend to file more, and more costly, claims than people with high insurance scores, and this makes sense, according to FICO. The care that people take when they use credit tends to carry over to other things, such as driving behavior and car maintenance, the company says. Statistical models for calculating credit-based insurance scores vary. Insurance scores do not include personal characteristics such as your age, gender, race, salary, occupation, address or marital status. Paying all of your loans and credit card bills on time is the most important thing you can do to get a good insurance score, FICO says. The company weighs payment history more than any other factor. In addition, keep your credit card balances low, and be cautious about applying for additional credit. If you’ve maxed out your credit cards, work on paying down the balances, and think twice before filling out retail store credit card applications just to get discounts. Having little or no credit history, which can make it tough to qualify for a loan, doesn’t necessarily impact your insurance score. Many states require insurance scoring systems to consider a thin credit history as a neutral factor. How do you find out your insurance score? Federal law doesn’t require companies to release insurance scores, but LexisNexis lets consumers order copies of theirs from its website. Some states require insurance companies to let you know they’re using credit information to set rates and to notify you if the credit information is a deciding factor in rejecting your application or charging higher premiums. In some states, they may have to give you a free copy of the credit report. You’re also entitled to see copies of your credit reports under federal law. You can get free copies of your credit reports from each of the national credit reporting agencies at AnnualCreditReport.com. It’s a good idea to check the reports once a year for accuracy. Mistakes happen and can result in faulty credit or insurance scores. If you discover errors, contact the appropriate credit bureau to request corrections. You wouldn’t want a mistake to mess up your chances of finding cheap car insurance.